visitors with a multitude of activities encompassing all four of Minnesota's seasons. and of course, fishing on one of the eight lakes on the Cass Lake Chain of lakes. the area or just relax and savor the serenity of the area. 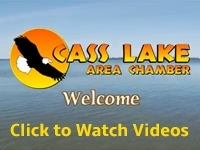 The Fishing Experience of a Lifetime In the Cass Lake area, there is one thing we do all year around, and that is fishing! In centuries past, it may have been even a matter of life or death, whether or not a meal was speared, netted, or caught on a bone carved hook. As the first settlers arrived, it was a necessity of their diet, along with the animals and birds they harvested. We have a community library and Cass Lake Museum and Lyle's Logging Camp. We are also within 30 miles of the Moondance Jam Grounds that host Jammin Country and Moondance Jam. We are 15 miles from Bemidji. Jan -8.8 F° 3.4 F° 15.6 F° 0.8 "
Feb -1.8 F° 11.0 F° 23.8 F° 0.7 "
Mar 13.4 F° 24.5 F° 35.6 F° 1.3 "
Apr 27.5 F° 39.5 F° 51.4 F° 1.8 "
May 40.7 F° 53.6 F° 66.6 F° 2.8 "
Jun 50.5 F° 62.6 F° 74.7 F° 4.0 "
Jul 55.5 F° 67.3 F° 79.0 F° 4.3 "
Aug 53.6 F° 65.3 F° 76.9 F° 3.4 "
Sep 44.4 F° 55.1 F° 65.9 F° 2.8 "
Oct 33.2 F° 43.0 F° 52.8 F° 2.6 "
Nov 17.2 F° 25.6 F° 33.9 F° 1.4 "
Dec -0.4 F° 9.9 F° 20.3 F° 0.7 "
Summer are warm and sunny for swimming, boating, and lots of water activities. Fall is very beautiful with the many colors on all the trees. Winter is great for ice fishing, spearing, ice skating, and snowmobiling. Spring bring us an abundance of beautiful colors of flowers. There is always the need for volunteers within the community.